Once again, I’ve got a lot of things to say on the gaming front. Let’s hop to it, shall we? WoW: All of the specs! 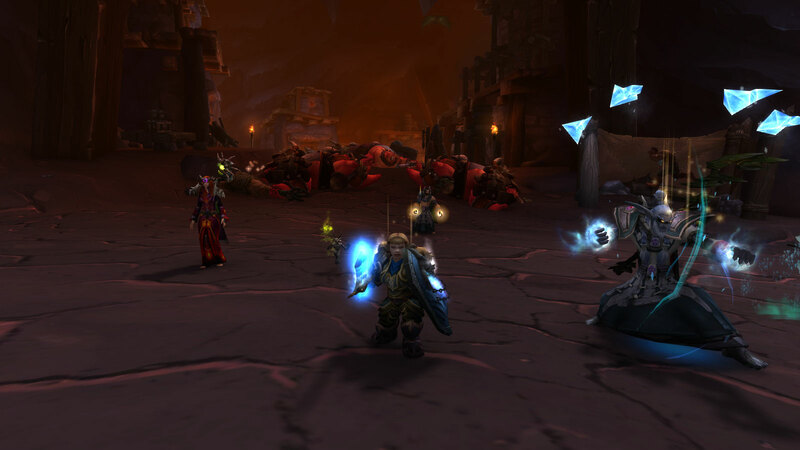 I’ve been continuing to try out as many of the class changes in World of Warcraft as I can. Firstly, with the new tri-spec feature, I’ve finally done some mistweaving on my monk. The last time I played mistweaver was all the way back in the Mists of Pandaria beta, where I determined it to be a very strange spec and wound up gravitating toward brewmaster instead. It’s changed a lot since then, but it’s still a strange spec. It’s basically a HoT spec that can’t easily spread its HoTs across multiple targets, which is usually the whole point of HoTs. For healing single targets, it works well and is fairly enjoyable. However, I find healing multiple targets frustrating. There’s no shortage of options on that front, but they all seem to come with some severe disadvantage. I do like the animation for essence font, though. I’ve also done some healing on my shaman, something I did a lot of back when I played him regularly. Although a few things have changed, for the most part restoration is as I remember it: a well-rounded “jack of all trades” healing with a broad toolkit. Of all the healing specs I’ve tried in 7.0, it’s easily the winner. I’ve also given elemental a shot. It proved surprisingly enjoyable. I don’t know how the current elemental compares to what it was like before the patch, but I like the current incarnation. Like restoration, it has a little bit of everything — a DoT, a proc, a quick filler, a big finisher — but what it lacks in clear identity it makes up for with solid gameplay. It’s the only ranged spec I’ve played so far that doesn’t feel gutted in 7.0. I’ve really enjoyed getting back to my shaman. I always had a lot of fondness for the character, and I regretted abandoning him. I think it might be time to take him out of mothballs. 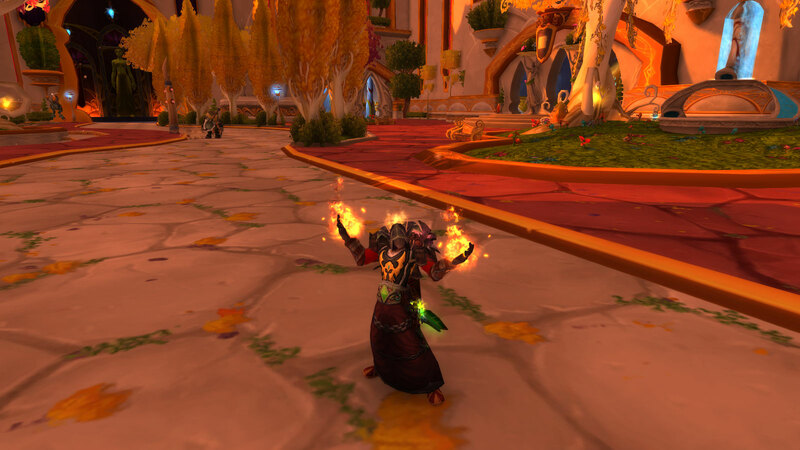 On the other hand, the more I’ve played my mage, the more I’ve realized that all the issues that drove me away from the class are still in full effect. It’s still too simplistic, and Blizzard is continuing its crusade to make sure each spec only uses spells from its primary school. This ensures each spec is flavourless and monochromatic while also failing to conceal the fact they all play more or less the same. A different colour of spells does not a spec identity make. Fire is so hollow now. It was never a terribly complex spec, but now it’s almost insultingly simple. Even your DoTs spread themselves for you now. I did try frost, and it’s a little better. Still simple, but it doesn’t feel quite so empty. And praise the Sunwell they finally gave them the option to play without the elemental. Mages were never meant to be a pet class. 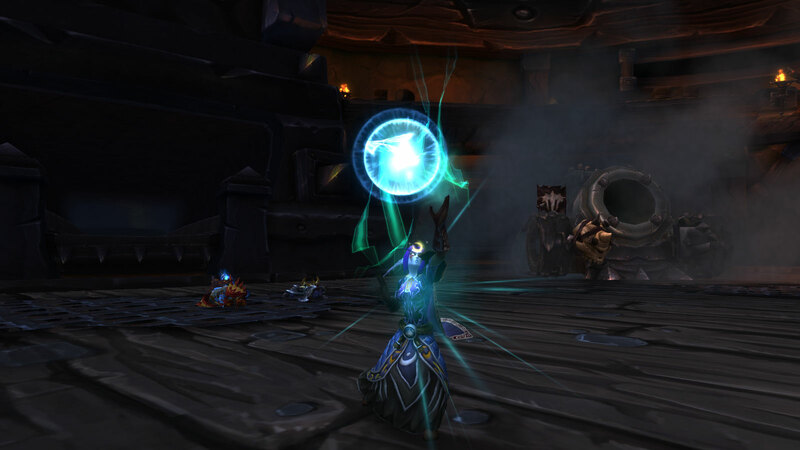 The simplicity of mages is what drove me to switch to playing a warlock in the first place. Of course, now warlocks are also heavily simplified. Still not to the extent of mages, but the gap is now small enough I don’t feel entirely justified in looking down my nose at them anymore. And if you can’t sneer at mages, what’s the point of even playing a warlock? Protection paladin did turn out to be a fair bit more entertaining than it used to be — mainly just because of the option to have no cooldown on HAMMER OF THE RIGHTEOUS — but like brewmaster, it seems rather undertuned right now. I was expecting very little from the new version of retribution, but it turned out to be pretty good. Maybe better than before. Still not sure why they got rid of exorcism — it could have easily filled the role given to blade of justice — but it feels good. Surprisingly fast. With the right talents, it’s at least as spammy as a rogue or windwalker. Finally, I’ve given tanking on my warrior a try. I like it, though the fact it’s currently the only tank spec (of those I’ve played) that doesn’t feel severely undertuned probably has something to do with that. The amount of damage you can absorb with ignore pain is staggering. There’s also a certain amusement to watching a ball of screaming Dwarf lady pinball around the battlefield. NO KNEECAP IS SAFE. 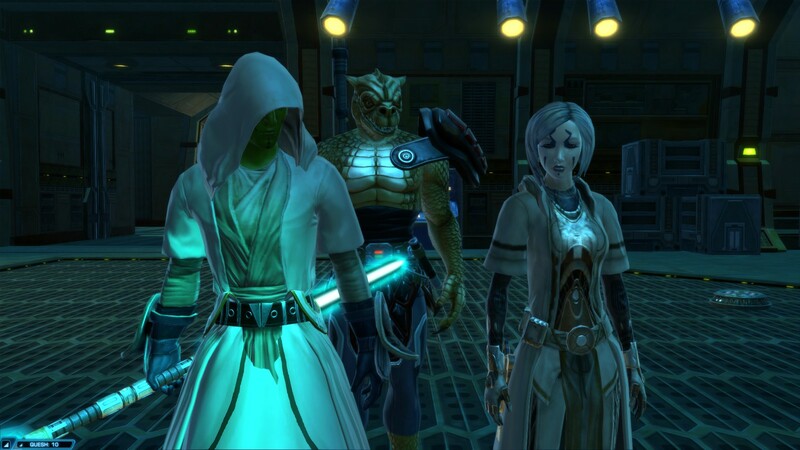 The general response to the Dark versus Light event in Star Wars: The Old Republic has been, shall we say, less than glowing. I can’t say I disagree with any of the criticism, and I very nearly didn’t participate at all. Still, the sheer volume of different rewards eventually won me over. I do still have several classes that I haven’t leveled yet, which is an advantage. But I leveled another consular instead. Let me explain the method to my madness. 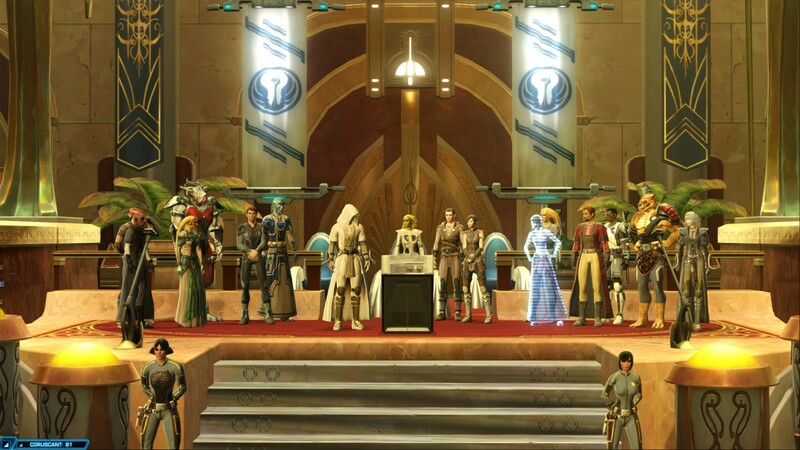 I’ve seen enough of the Republic side to know that consular is the class that I feel the most connection with, and I do want to play the expansions as a Republic character to see both sides. However, I didn’t much enjoy the gameplay of the subclass I’d chosen. So I decided to reroll as the melee subclass (shadow, I think). Despite still being relatively new to the game, I’ve quickly developed a pretty good understanding of how to level fast, so by making heavy of use every available XP boost, I was able to complete the class story quite quickly. I enjoy the consular story, so I didn’t mind playing it all again, though I would have preferred more of a gap between my original playthrough and the second. It was nice to see Nadia again, at least, and the new subclass is more fun. I haven’t changed my behaviour at all because of the event. I still just pick whatever choice seems best at the time, which means light side in most cases, but not all. I want light side to win, but I’m not going to let Stark live just for that. So far I’ve completed the first two tiers of the event. I’m sure I’ll get the third one done before it closes. I had intended to start a second character to get the fourth and fifth tiers done, but now I’m not so sure. It’s a lot of effort for uncertain rewards. I’ve already got Satele Shan’s boots, which was the main thing I wanted from the event. It does seem silly to invest in the event without the main reward — the new companion — but realistically I don’t see myself using a companion with little or no story relevance very often. And if the dark side ends up winning then I really don’t care. Only Chiss nationalism got me interested at all. I am still playing Landmark, albeit quite sporadically. I did grab the new racial customization pack. Paying for race choices feels a bit distasteful, but it’s such an inexpensive game to begin with it’s hard to complain too much. And given the choice, you should always be an Elf. In my case, a Dark Elf. With horns. For a while I was just wandering aimlessly, but I came up with an idea for another build, so I bought a second claim. It’s currently quite unfinished. I’m being a fair bit more ambitious with this build, which I may regret. Let me tell you: Digging out a new valley is easy. Making it look natural isn’t. In the meanwhile, my original build is finished and ready for visitors. Maigraith’s Grove on Silver Shallows (Serenity). Southeast of the spire — look for the giant pine tree. One final thing worth noting is that my interest in Heroes of the Storm has fallen off a cliff as of late. I haven’t logged in since Gul’dan’s launch, and my play had been falling off sharply even before then. I’m just not having fun anymore. Losing feels much more frustrating than it used to, and winning no longer has the same satisfaction. Perhaps it’s just good honest burnout. I have been playing the game all but continuously since alpha. That’s a lot for any game. I also have some issues with the current metagame. Burst damage has become so prevalent that team fights are beginning to feel more like they do in Overwatch — you’re dead within seconds, sometimes without even knowing what hit you. Except it takes you several times longer to respawn than it does in Overwatch. Chromie really sucked a lot of fun from the game for me. There may be more all around effective heroes, but none are so stressful to play against. She can do so much damage before you even know she’s there. An AoE skillshot that can take out 30% or more a tank’s health that you can’t see coming should never have been allowed in the game. Nova was similar, but she had to work a lot harder to one-shot you, and she didn’t have the sustained damage of Chromie. The most worrying possibility is that it may be the result of stress in my Real Life. If that’s the case, my time with Heroes may be done for the foreseeable future. My life ain’t getting any less stressful anytime soon. 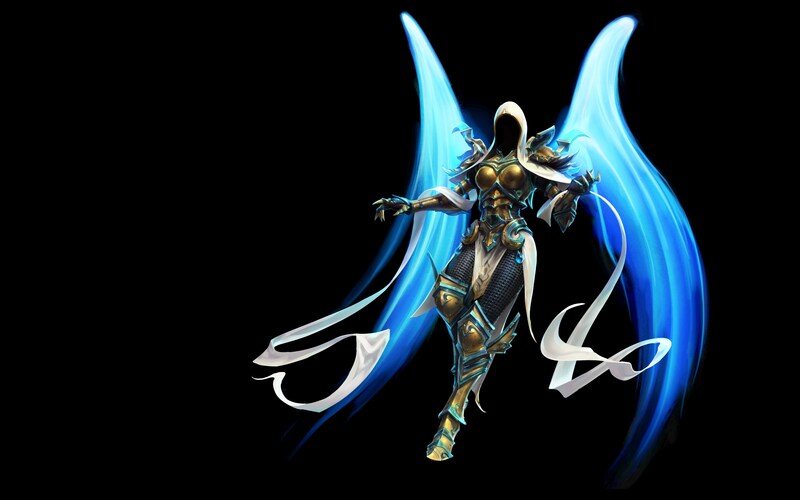 Even the upcoming release of Auriel, the Archangel of Hope, isn’t much exciting me, and I’ve wanted to see her in Heroes for a long time. I’m not sure if I’ll try her or not. It’s a real shame, because she does seem like a pretty unique hero. A healer that doesn’t use mana? Now you’re speaking my language. This entry was posted in Games and tagged because Elves that's why, fantasy, Heroes of the Storm, Landmark, sci-fi, Star Wars: The Old Republic, World of Warcraft by Tyler F.M. Edwards. Bookmark the permalink.